On Wednesday, September 27, 2017, the Stanford University graduate School of Civil and Environmental Engineering will be reviewing Cordoba Corporation as part of the fall Watson Seminar and Speaker Series. Cordoba Corporation is a statewide full-service civil engineering, ENR Top 50 Program Management Firm and Top 100 Construction Management-for-Fee Firm specializing in the delivery of infrastructure projects in transportation, education, water and energy sector. Randall D. Martinez, Cordoba’s Executive Vice President and Chief Operating Officer will provide his insight and observations from his 30-year career at Cordoba in the public infrastructure design and construction business. Randall started his career with Cordoba in 1989 as a freshly minted college graduate when Cordoba was a firm with just ten employees. Nearly 30 years later, Cordoba now has more than 200 employees and is continuing to grow. Randall will share about Cordoba’s growth and development as a company, his take on Cordoba’s position in the marketplace, and strategic plans for expansion. Randall will be joined by Lynette Berk, Cordoba’s new Talent Acquisition Manager, who is responsible for recruitment at Cordoba. 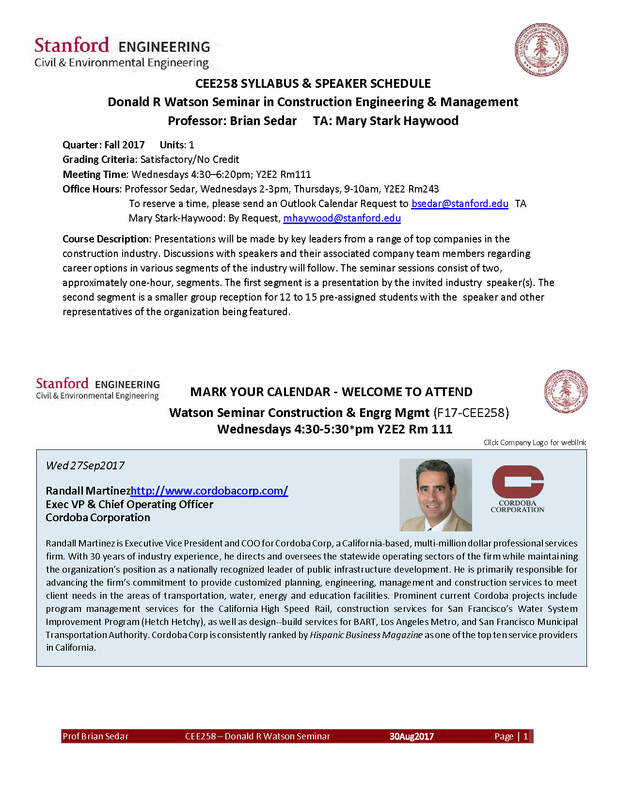 The Donald R. Watson Seminar in Construction & Engineering Management at Stanford University is a graduate construction program consisting of a series of ten presentations by key leaders from a range of top companies in the construction industry. Following each presentation there are focused 1-1 discussions with speakers and their associated company team members regarding career options in various segments of the industry. 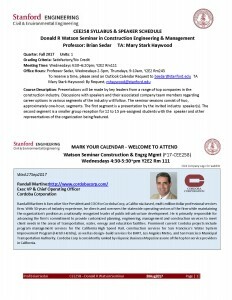 In addition to supporting the Watson Seminar at Stanford University, Cordoba Corporation is a member of the Stanford Construction Institute, which was launched in 1960 as one of Stanford’s first Industrial Affiliate Programs to support enrichment of Stanford’s Construction MS educational program by enabling the university to engage practicing professionals from industry as consulting professors and lecturers. Cordoba Corporation’s President and Chief Executive Officer George L. Pla currently serves on the Stanford Construction Institute’s Program Advisory Committee, a group which provides ongoing input to the design of Stanford’s MS degree programs in Civil and Environmental Engineering.